Not to be confused with Knights of Sidonia. 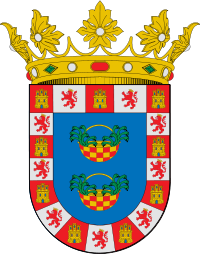 The Duke of Medina Sidonia is a grandee of Spain in Medina-Sidonia, holding the oldest extant dukedom in the kingdom, first awarded by King John II of Castile in 1445. They were once the most prominent magnate family of the Andalusian region, the best-known of whom, Don Alonso de Guzmán El Bueno, 7th Duke of Medina Sidonia, commanded the Spanish Armada at the end of the 16th century. The defeat at the hands of weather and the English in 1588 brought disgrace to this family. The House of Medina Sidonia traces its descent to Alonso Pérez de Guzmán. ^ DE MEDINA, Pedro (b. 1503), Crónica de los Duques de Medina Sidonia por el Maestro Pedro de Medina. Manuscrito de 1561 en el Archivo de la Casa Ducal de Medinasidonia, leg. 1316. Colección de Documentos Inéditos para la Historia de España no. XXXIX, 1932. Page 206.